Coal 101: What's Wrong with Coal? Acid mine drainage (AMD) refers to the outflow of acidic water from coal mines or metal mines, often abandoned mines where ore- or coal mining activities have exposed rocks containing the sulphur-bearing mineral pyrite. Pyrite reacts with air and water to form sulphuric acid and dissolved iron, and as water washes through mines, this compound forms a dilute acid, which can wash into nearby rivers and streams. Air pollution from coal-fired power plants includes sulfur dioxide, nitrogen oxides, particulate matter (PM), and heavy metals, leading to smog, acid rain, toxins in the environment, and numerous respiratory, cardiovascular, and cerebrovascular effects. Air pollution from coal mines is mainly due to emissions of particulate matter and gases including methane (CH4), sulfur dioxide (SO2), and nitrogen oxides (NOx), as well as carbon monoxide (CO). Climate impacts of coal plants - Coal-fired power plants are responsible for one-third of America’s carbon dioxide (CO2) emissions, making coal a huge contributor to global warming. Black carbon resulting from incomplete combustion is an additional contributor to climate change. Coal dust stirred up during the mining process, as well as released during coal transport, which can cause severe and potentially deadly respiratory problems. Coal fires occur in both abandoned coal mines and coal waste piles. Internationally, thousands of underground coal fires are burning now. Global coal fire emissions are estimated to include 40 tons of mercury going into the atmosphere annually, and three percent of the world's annual carbon dioxide emissions. Coal combustion waste is the nation's second largest waste stream after municipal solid waste. It is disposed of in landfills or "surface impoundments," which are lined with compacted clay soil, a plastic sheet, or both. As rain filters through the toxic ash pits year after year, the toxic metals are leached out into the local environment. Coal sludge, also known as slurry, is the liquid coal waste generated by washing coal. It is typically disposed of at impoundments located near coal mines, but in some cases it is directly injected into abandoned underground mines. Since coal sludge contains toxins, leaks or spills can endanger underground and surface waters. Floods such as the Buffalo Creek Flood caused by mountaintop removal mining and failures of coal mine impoundments. Forest destruction caused by mountaintop removal mining - According to a 2010 study, mountaintop removal mining has destroyed 6.8% of Appalachia's forests. Greenhouse gas emissions caused by surface mining - According to a 2010 study, mountaintop removal mining releases large amounts of carbon through clearcutting and burning of trees and through releases of carbon in soil brought to the surface by mining operations. These greenhouse gas emissions amount to at least 7% of conventional power plant emissions. Loss or degradation of groundwater - Since coal seams are often serve as underground aquifers, removal of coal beds may result in drastic changes in hydrology after mining has been completed. Heavy metals and coal - Coal contains many heavy metals, as it is created through compressed organic matter containing virtually every element in the periodic table - mainly carbon, but also heavy metals. The heavy metal content of coal varies by coal seam and geographic region. Small amounts of heavy metals can be necessary for health, but too much may cause acute or chronic toxicity (poisoning). Many of the heavy metals released in the mining and burning of coal are environmentally and biologically toxic elements, such as lead, mercury, nickel, tin, cadmium, antimony, and arsenic, as well as radio isotopes of thorium and strontium. Mercury and coal - Emissions from coal-fired power plants are the largest source of mercury in the United States, accounting for about 41 percent (48 tons in 1999) of industrial releases. Methane released by coal mining accounts for about 10 percent of US releases of methane (CH4), a potent global warming gas. Mountaintop removal mining and other forms of surface mining can lead to the drastic alteration of landscapes, destruction of habitat, damages to water supplies, and air pollution. Not all of these effects can be adequately addressed through coal mine reclamation. Radioactivity and coal - Coal contains minor amounts of the radioactive elements, uranium and thorium. When coal is burned, the fly ash contains uranium and thorium "at up to 10 times their original levels." Subsidence - Land subsidence may occur after any type of underground mining, but it is particularly common in the case of longwall mining. Sulfur dioxide and coal - Coal-fired power plants are the largest human-caused source of sulfur dioxide, a pollutant gas that contributes to the production of acid rain and causes significant health problems. Coal naturally contains sulfur, and when coal is burned, the sulfur combines with oxygen to form sulfur oxides. Thermal pollution from coal plants is the degradation of water quality by power plants and industrial manufacturers - when water used as a coolant is returned to the natural environment at a higher temperature, the change in temperature impacts organisms by decreasing oxygen supply, and affecting ecosystem composition. Toxins - According to a July 2011 NRDC report, "How Power Plants Contaminate Our Air and States" electricity generation in the U.S. releases 381,740,601 lbs. of toxic air pollution annually, or 49% of total national emissions, based on data from the EPA’s Toxic Release Inventory (2009 data, accessed June 2011). Power plants are the leading sources of toxic air pollution in all but four of the top 20 states by electric sector emissions. Transportation - Coal is often transported via trucks, railroads, and large cargo ships, which release air pollution such as soot and can lead to disasters that ruin the environment, such as the Shen Neng 1 coal carrier collision with the Great Barrier Reef, Australia that occurred in April 2010. Waste coal, also known as "culm," "gob," or "boney," is made up of unused coal mixed with soil and rock from previous mining operations. 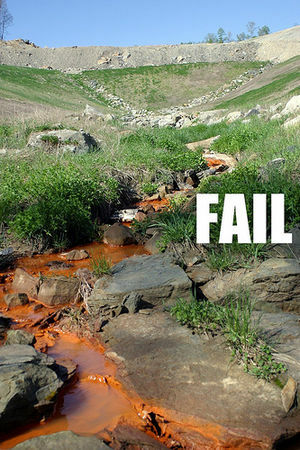 Runoff from waste coal sites can pollute local water supplies. Water consumption from coal plants - Power generation has been estimated to be second only to agriculture in being the largest domestic user of water. Water pollution from coal includes the negative health and environmental effects from the mining, processing, burning, and waste storage of coal. NASA scientist James Hansen, who reported to the U.S. Congress that climate change was underway in 1988, has been particularly critical of the coal industry, stating that coal contributes the largest percentage of anthropogenic carbon dioxide into the atmosphere. He acknowledges that a molecule of carbon dioxide emitted from burning coal has the same effect as a molecule emitted from burning oil, but that the difference is where the fuel originally resides. He says that most oil comes from Russia and Saudi Arabia, and that no matter how fuel-efficient automobiles become, the oil will eventually be burned and the carbon dioxide emitted, but that a phase-out of coal is entirely possible. In a 2007 testimony before the Iowa Utilities Board, he stated that the United States has a large reservoir of coal, which makes it a resource that can be controlled through action by U.S. politicians, unlike oil which is controlled by other countries. He and other climate scientists have called for coal phase out completely by the year 2030. 10,200 tons of nitrogen oxides (NOx), equivalent to half a million late-model cars. NOx leads to formation of smog, which inflames lung tissue and increases susceptibility to respiratory illness. Coal contains minor amounts of the radioactive elements, uranium and thorium. When coal is burnt, the fly ash contains uranium and thorium "at up to 10 times their original levels." According to a New York Times analysis of EPA data, power plants are the nation’s biggest producer of toxic waste, surpassing industries like plastic, paint manufacturing, and chemical plants. Solid waste from a typical 500MW coal plant contains 120,000 tons of ash and 193,000 tons of coal sludge from the smokestack scrubber. In the U.S. more than 75 percent of this waste is disposed of in unlined, unmonitored landfills and surface impoundments, and can leach into and contaminate drinking water. Toxic substances in ash and sludge include arsenic, mercury, chromium, and cadmium. There is no federal regulation for the disposal of fly ash. A 2007 EPA report cited 67 cases in the United States of damage to ground or surface water from coal-combustion products. The Oak Ridge National Laboratory estimates that in an average year, a typical 1000 MW coal plant releases significant amounts of radioactive material, including 5.2 tons of uranium and 12.8 tons of thorium. Acid mine drainage (AMD) refers to the outflow of acidic water from coal or metal mines, often abandoned ones where ore- or coal mining activities have exposed rocks containing the sulphur-bearing mineral pyrite. Pyrite reacts with air and water to form sulphuric acid and dissolved iron, and as water washes through mines, this compound forms a dilute acid, which can wash into nearby rivers and streams. AMD discharges elevated concentrations of acidity, iron, manganese, aluminum, and sulfate into receiving streams and rivers, depleting the buffering ability of water by neutralizing carbonate and bicarbonate ions that form carbonic acid. Streams and rivers with low buffer capacity are not able to neutralize the acid load and consequently become acidic. An estimated 2,390 miles of streams in the Allegheny and Monongahela River Basins have been degraded by AMD to the point of not being able to support fish communities. The use of bagpipes and scrubbers to trap pollutants and toxins from power plant emissions - such as arsenic, aluminum, boron, chromium, manganese, nickel, or chemicals that have been linked to health risks - can leach into groundwater and waterways, contaminating drinking water supplies. As of January 2010, no federal regulations specifically govern the disposal of power plant discharges into waterways or landfills. Some regulators have used the Clean Water Act to try and limit pollution, but the law does not mandate limits on many dangerous chemicals in power plant waste, like arsenic and lead. According to a New York Times analysis of EPA records, 21 power plants in 10 states have dumped arsenic into rivers or other waters at concentrations as much as 18 times the federal drinking water standard. State officials sometimes place no limits on water discharges of arsenic, aluminum, boron, chromium, manganese, nickel or other chemicals that have been linked to health risks. Only one in 43 U.S. power plants must limit how much barium is dumped into nearby waterways, despite being commonly found in power plant waste and scrubber wastewater and linked to heart problems and disease. EPA records indicate power plant landfills and other disposal practices have polluted groundwater in more than a dozen states, while a 2007 EPA report suggested that people living near some power plant landfills faced a cancer risk 2,000 times higher than federal health standards. Power plants have often violated the Clean Water Act without paying fines or facing other penalties: ninety percent of 313 coal-fired power plants that violated the law since 2004 were not fined or otherwise sanctioned by federal or state regulators. And fines are often modest: Hatfield’s Ferry has violated the Clean Water Act 33 times since 2006, but has paid less than $26,000, even as the plant’s parent company earned $1.1 billion. According to the New York Times, after five states — including New York and New Jersey — sued Allegheny Energy to install scrubbers at one of its coal plants, the company began dumping tens of thousands of gallons of wastewater containing chemicals from the scrubbing process into the Monongahela River. The River provides drinking water to 350,000 people and flows into Pittsburgh. Power generation has been estimated to be second only to agriculture in being the largest domestic user of water. Water is used by thermoelectric generating facilities (coal, natural gas, and nuclear) to make electricity through converting the water into high-pressure steam to drive turbines. Once through this cycle, the steam is cooled and condensed back into water, with some technologies using water to cool the steam, increasing a plant's water usage. In coal plants, water is also used to clean and process the fuel itself. The U.S. Geological Survey estimates that thermoelectric plants withdrew 195 billion gallons of water per day in 2000, of which 136 billion gallons was fresh water. Integrated Gasification Combined Cycle (IGCC), which converts coal into synthetic gas or syngas to extract more energy, is being promoted as a path toward carbon capture and storage; however as of 2009 capturing carbon dioxide (CO2) reduces plant efficiency and increases water usage. An Electric Power Research Institute study found CO2 capture equipment decreased plant output by at least 25% and increases water consumption by approximately 23%. Thermal pollution is the degradation of water quality by any process that changes ambient water temperature. A common cause of thermal pollution is the use of water as a coolant by power plants and industrial manufacturers. When water used as a coolant is returned to the natural environment at a higher temperature, the change in temperature impacts organisms by (a) decreasing oxygen supply, and (b) affecting ecosystem composition. When a power plant first opens or shuts down for repair or other causes, fish and other organisms adapted to particular temperature range can be killed by the abrupt rise in water temperature known as 'thermal shock': most aquatic organisms have developed enzyme systems that operate in only narrow ranges of temperature, and can be killed by sudden temperature changes that are beyond the tolerance limits of their metabolic systems. the release of methane (CH4), a potent greenhouse gas estimated to account for 18% of the overall global warming effect triggered by human activities (CO2 is estimated to contribute 50%). the release of carbon monoxide (CO) from explosives, which pollutes the air and poses a health risk for mine workers. drastic alteration of the landscape, which can render an area unfit for other purposes, even after coal mine reclamation. The clearing of trees, plants, and topsoil from mining areas destroys forests and natural wildlife habitats. It also promotes soil erosion and flooding, and stirs up dust pollution that can lead to respiratory problems in nearby communities. In mountaintop removal mining, most common in the Appalachian region of the U.S., mountaintops are literally blown off to reach coal seams, with the waste products deposited into valleys below, causing permanent damage to the landscape and the local ecosystem. According to the Sierra Club, this practice has "damaged or destroyed approximately 1,200 miles of streams, disrupted drinking water supplies, flooded communities, eliminated forests, and destroyed wildlife habitat. Coal companies have created at least 6,800 fills to hold their mining wastes, and the government estimates that if this mining continues unabated in Appalachia it will destroy 1.4 million acres of land by 2020." water pollution, as sulfuric acid forms when coal is exposed to air and water, creating an acid run-off with heavy metals such as copper, lead, and mercury that can leech into streams, acidifying and polluting the water and killing fish, plants, and aquatic animals. Seepage from coal sludge can also infect local water supplies. dust and coal particles stirred up during the mining process, as well as the soot released during coal transport, which can cause severe and potentially deadly respiratory problems. As of June 2010, no national limits exist on air pollution from coal mines. On June 17, 2010, in a petition presented to Environmental Protection Agency Administrator Lisa Jackson, a coalition of environmental groups called for new controls over coal mine air pollution. The petition states that coal mines should be held to the Clean Air Act standards in force for gravel mines, coal-fired power plants, coal processing plants, and other sources. The petition also calls on Jackson to adopt strict limits on other dangerous air pollutants released from coal mines, including methane, as well as particulate matter, nitrogen oxide gases, and volatile organic compounds — all toxic air pollutants under the Clean Air Act. The long-distance transport of coal can also result in occasional but significant environmental impacts. In April 2010, a bulk carrier transporting approximately 65,000 tonnes of coal from Gladstone Australia to China ran aground on the Great Barrier Reef. See Shen Neng 1 coal carrier collision with the Great Barrier Reef, Australia. A 2009 National Academy of Sciences report, Hidden Cost of Energy: Unpriced Consequences of Energy Production and Use, found that the external costs of coal from US coal-fired power plants add up to over $62 billion in environmental damages a year. These include damage done to crop and timber yields, to buildings and materials, and the toll coal takes on human health--including the cost of illness and premature deaths. The study examined 406 coal plants that collectively create about 95% of the nation's coal-burned electricity. As Bloomberg notes, the "aggregate damages associated with sulfur dioxide, nitrogen oxides and particulate matter emitted by the facilities amounted to $156 million on average per plant." These are costs not borne by coal and power companies. The study did not consider any potential damages done by greenhouse gas emissions. A Feb. 2011 report, "Mining Coal, Mounting Costs: the Life Cycle Consequences of Coal," led by associate director of the Center for Health and the Global Environment at Harvard Medical School Dr. Paul Epstein, found that accounting for the full costs of coal would double or triple its price. The study, which was released in the Annals of the New York Academy of Sciences, tallied the economic, health and environmental costs associated with each stage in the life cycle of coal – extraction, transportation, processing, and combustion - and estimated those costs, which are borne by the public at large, to be between $175 billion and $500 billion dollars annually. In terms of human health, the report estimated $74.6 billion a year in public health burdens in Appalachian communities, with a majority of the impact resulting from increased healthcare costs, injury and death. Air pollutants from combustion accounted for $187.5 billion, mercury impacts as much as $29.3 billion, and climate contributions from combustion between $61.7 and $205.8 billion. The study discussed a number of other impacts that are not easily quantified, including effects of heavy metal toxins and carcinogens released into water supplies as part of coal mining and processing; the death and injury of workers mining coal; and the social impacts in mining communities. "Our comprehensive review finds that the best estimate for the total economically quantifiable costs, based on a conservative weighting of many of the study findings, amount to some $345.3 billion, adding close to 17.8¢/kWh of electricity generated from coal. The low estimate is $175 billion, or over 9¢/kWh, while the true monetizable costs could be as much as the upper bounds of $523.3 billion, adding close to 26.89¢/kWh. These and the more difficult to quantify externalities are borne by the general public." The average residential price of electricity at the time of the report is 12¢/kWh. Skeptical Science notes that when the coal externalities of the study are included in coal's price, it increases the levalized costs to approximately 28 cents per kWh, which is more than the 2009 U.S. Energy Information Administration cost of hydroelectric, wind (onshore and offshore), geothermal, biomass, nuclear, natural gas, and solar photovoltaics, and is on par with solar thermal, although the costs of solar thermal are falling. "Still these figures do not represent the full societal and environmental burden of coal. In quantifying the damages, we have omitted the impacts of toxic chemicals and heavy metals on ecological systems and diverse plants and animals; some ill-health endpoints (morbidity) aside from mortality related to air pollutants released through coal combustion that are still not captured; the direct risks and hazards posed by coal sludge, coal slurry, and coal waste impoundments; the full contributions of nitrogen deposition to eutrophication of fresh and coastal sea water; the prolonged impacts of acid rain and acid mine drainage; many of the long-term impacts on the physical and mental health of those living in coal-field regions and nearby MTR sites; some of the health impacts and climate forcing due to increased tropospheric ozone formation; and the full assessment of impacts due to an increasingly unstable climate." ↑ 2.0 2.1 "Green Coal?," Rachel's Environment & Health News, November 6, 2008. ↑ "Black Carbon Implicated in Global Warming" Science daily, July 30, 2010. ↑ 6.0 6.1 6.2 6.3 6.4 "The Dirty Truth about Coal: Mining", Sierra Club, June 2007. ↑ Dan Cray (July 23, 2010). "Deep Underground, Miles of Hidden Wildfires Rage", Time Magazine. ↑ Kristin Ohlson, "Earth On Fire" Discover Magazine, January 4, 2011. ↑ "Analyzing why all landfills leak," Rachel's Environment & Health News, February 14, 1989. ↑ "EPA says all landfills leak, even those using best available liners," Rachel's Environment & Health News, August 10, 1987. ↑ U.S. Environmental Protection Agency ,"Methane: sources and emissions," U.S. Environmental Protection Agency website, October 20th, 2006. ↑ "Key Issues & Mandates: Secure & Reliable Energy Supplies - Coal Becomes a 'Future Fuel'” NETL, accessed May 2010. ↑ Mara Hvistendahl, "Coal Ash is More Radioactive than Nuclear Waste", Scientific American, December 13, 2007. ↑ "Indiana town to Chesapeake: Fly-ash battle won’t be easy," Virginia Pilot, October 17, 2008. ↑ Coal Combustion: Nuclear Resource or Danger, ORNL Review Vol. 26, Nos. 3&4, 1993. ↑ 50.0 50.1 Environmental Impacts of Coal Mining, World Coal Institute, accessed April 2008. ↑ "Coal mine air pollution targeted" WY Business report, June 18, 2010. ↑ Brian Merchant, "Coal Plants Do $62 Billion of Damage a Year to US Environment Treehugger, Oct. 19, 2009. ↑ 53.0 53.1 53.2 53.3 53.4 "Life-cycle study: Accounting for total harm from coal would add 'close to 17.8¢/kWh of electricity generated'” Climate Progress, Feb. 16, 2011. ↑ "The True Cost of Coal Power" Skeptical Science, March 18, 2011. "Deadly power plants? Study fuels debate: Thousands of early deaths tied to emissions", MSNBC, June 9, 2004. The Dirty Truth about Coal: Why Yesterday's Technology Should Not Be Part of Tomorrow's Energy Future", Sierra Club, June 2007. This page was last edited on 16 March 2015, at 20:22.